We’ve hardly begun this conference, and we already have a venue for the next Plenipotentiary in 2018: the United Arab Emirates. 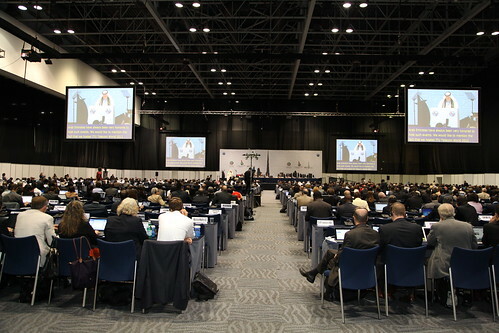 The UAE hosted another big ITU event, the World Conference on International Telecommunications (WCIT), in 2012. In contrast, attendance by women at ITU Plenipotentiaries 2010 and 2014 looks positively rosy: in both plenipots, women have formed around 21% of the total delegate population. The breakfast ended on a more upbeat note, with four female ICT ministers from Nigeria, Poland, Qatar and Sudan answering questions about the role and prospects for women in ICT. Most of the statements followed the standard format of thanks, facts and figures about ICT developments in their countries and a request to please vote for them in this week’s ITU elections. Many developing countries also referred to the assistance they had received from ITU and other ITU Member States to help develop their ICT infrastructure and services. It is worth remembering that the assistance the ITU has been able to provide to developing countries is one of the main reasons so many developing countries are such strong supporters of ITU. For these countries, ITU really has been an effective UN body. Of course, the other side of the coin is that the occupants of the some of the largest donor States do not see ITU doing anything to progress their needs or wants, and wonder if their money is being well spent (for example, there was a 2013 petition asking the US government to stop funding the ITU). Afghanistan reported on the exponential growth of ICTs in its country since 2002, when its citizens needed to cross into adjoining countries to make a simple phone call. If you ever wondered whether the ITU is relevant in this day and age, cases like Afghanistan prove that it can and does play a fundamental role in supporting the development of ICTs in developing countries. Brazil, which couldn’t get any mention of NETmundial included in this year’s CSTD draft ECOSOC resolution on WSIS follow-up, did make sure it highlighted NETmundial in its policy statement. It also highlighted President Roussef’s speech at the UN General Assembly in 2013, where she presented her principles for management of the Internet, which then became the underlying framework of the NETmundial outcome document. India, which has a reputation for having a rather multiple personality approach to Internet governance (it depends which department is doing the talking), presented a pro-multilateral position in its policy statement. It highlighted its concerns that a country’s critical information infrastructure could be knocked out by cyber attacks and hoped that via ITU, Member States would work to harmonize their national policy and regulations to provide an effective response to cyber threats. India’s policy statement is directly linked to their very recently proposal for a new resolution, ITU’s role in realizing Secure Information Society. India previously submitted the proposal to the regional Asia Pacific group of ITU Member States, the Asia Pacific Telecommunity, but there was no consensus to support it as a common Asia Pacific proposal. Finally, clearly having missed the memo that ITU now embraces gender equality and mainstreaming, it referred to its fellow Member States as “brotherly”. Hm. Iran had one of the most interesting of speeches to date. Not particularly known as a vocal supporter of the multistakeholder principles of WSIS, Iran referred a number of times to “stakeholders”. It never actually said the “M” word (“multistakeholder”) but the mere use of the term “stakeholder”, a concept that is integral to multistakeholderism, is significant. Malaysia, with their recent experience of the loss of two Malaysian Airlines planes, stressed the importance of developing more advanced systems of communications for the airline industry. While this may seem like a very specific concern to be raising, it demonstrates the fact that Member State priorities at ITU are often direct responses to immediate and very personal experiences of the country. Mexico announced that it is so committed to the work ITU is doing, it is raising its financial contribution to ITU from one contributory unit to three. That amounts to an extra CHF 600,000 per year. UK, which supports a common European regional proposal to open the vast majority of ITU documents to the public,took the opportunity toemphasize its believe that ITU should make its processes and forums transparent and made publicly available wherever possible. This is probably linked, in particular, to previous debates in ITU Council about making the meetings and documents of the Member States-only Council Working Group on International Internet-related Public Policy Issues (CWG-Internet) available to other Internet governance stakeholders. Those ITU Council meetings decided that it wasn’t up to the Council to decide on the issue, but it had to be a matter for all States at the Plenipotentiary to reach agreement on. Ukraine, deeply unhappy about Russia’s annexation of Crimea, took the opportunity to describe Crimea as a “temporarily occupied territory of Ukraine” and protest the use of Ukrainian telecommunication networks and frequencies by Russian telecommunication operators and broadcasting organizations now operating in Crimea. So we can add the new set of tensions between Ukraine and Russia to the traditional tensions between USA and Cuba and Palestine and Israel to the mix of geopolitical hostilities that will crop up from time to time during the week. Of course, a specialized UN forum like the ITU is not going to be able to settle such problems, but given there is no one-stop-shop venue to settle these inter-country disputes, the aggrieved countries will use every UN forum to raise the profile of their dispute in the hope that specialized resolutions from individual UN forums may over time help their greater cause. Next week, the WSIS+10 High Level Event (HLE), coordinated by the ITU, will be held in Geneva as an extended version of the annual WSIS Forum. The WSIS+10 HLE began its life as an ITU-specific initiative, but mirroring the creation of the initial WSIS process, the WSIS+10 HLE had subsequently become part of the larger UN-wide process to conduct a 10-year review of WSIS. Originally, the HLE was supposed to take place in Sharm el-Sheikh, 13-17 April 2014. But due to ongoing uncertainty about the political situation in Egypt, it was decided to move the HLE to Geneva, where WSIS Forums are usually held. Along with the change of venue, there would also need to be a change of dates. At first, it was thought that the meeting might be pushed to the end of 2014, but eventually, it was announced that the HLE would be held 10-13 June, with pre-events (a bit like the IGF “Day 0”) on 9 June. The second additional MPP was supposed to be held in Sharm el-Sheikh. This was no doubt a kind of diplomatic consolation prize to Egypt: while it wasn’t possible to risk the security of a bunch of government ministers at a Sharm-based HLE, sending the lower level folks who attend MPP meetings was more a more acceptable risk. Fewer non-government participants seem to have attended as the calendar of meetings continued. For governments with missions in Geneva, it’s been relatively easy to have mission-based staff pop down the road to attend additional MPPs as they have occurred. For non-government participants, however, it is difficult to find the funding to fly around the world to attend meetings that haven’t been budgeted for. It’s also hard to justify spending funds on attending meetings where progress has been very slow. Yes, remote participation has been an option, but it’s no substitute for onsite participation, where people making interventions from the floor can continue to engage in realtime discussions with the Chair and other participants. In contrast, remote participants generally have had their interventions read out, are thanked, then the onsite participants move on and the remote interventions are pretty much left behind. Remote participants are also unable to participate in the informal negotiations and discussions that happen outside formal plenary sessions. I should point out that these remote participation problems are not solely the problem of MPP meetings. They’re experienced in a multitude of other forums that also use remote participation mechanisms. As it’s become clearer that the UN-wide final review of WSIS+10 in 2015 is extremely unlikely to result in a complete rewriting of the WSIS goals, the outcome documents of the HLE have taken on more significance. For those reasonably happy with the Tunis Agenda—with its endorsement of multistakeholder participation, even if it contains some ongoing minefields such as “enhanced cooperation”—the fact that 2015 won’t rewrite the way forward for ICTs isn’t a problem. But for those who are unhappy with the implementation of WSIS goals over the past decade, the HLE documents have now become the possibly only way to induce changes to the direction of WSIS over the next decade. There had also been an attempt to remove some of the heat from the MPP negotiations by removing any discussion of Internet governance issues, including any reference to “enhanced cooperation”, even if it wasn’t in relation to Internet governance. But it didn’t substantially speed up the overall process of negotiation. By the April MPP, the majority of interventions were from government representatives rather than non-government stakeholders. Partially this was a reflection of the fact that more government folks seemed to be at the meeting, as noted above, but it was also a reflection of the fact a few number of government representatives dominated the floor so very much that most of the non-government representatives largely disengaged from the process. A few non-government folk decided to fight fire with fire, and raise their flag as much as some of their more garrulous counterparts in government. A risk of doing that, however, was that it could reinforce the belief of governments suspicious of multistakeholder processes that it non-government obstructiveness was responsible for the failure to reach compromise. Putting square brackets around text that is proving difficult to reach consensus on. Using the “Australian method,” any text still left in square brackets at the end of the meeting will be deleted entirely. From my entirely subjective observations of the meetings, it seemed that some governments have insisted on square-bracketing text far more than others. In particular, it was the representatives of governments more likely to prefer multilateral negotiations who have invoked this method the most. The government representatives more used to working in multistakeholder environments have been more likely to want to keep working on the text until a compromise was reached. Package deals: “Nothing is agreed until everything is agreed”. Once again, this seemed to be a technique used by multilateral-leaning government representatives. Given some of the topics under discussion are fairly non-controversial, but others are highly controversial, this technique is a good way to ensure that you can hold the entire document hostage—if needed—on a topic you really, really don’t want the other side of the argument to “win”. If you tried this technique in a multistakeholder Internet governance process, you’d be considered to be a pretty ” bad faith” participant. But in intergovernmental processes, where people are often playing for high stakes, this is more grudgingly accepted, if not embraced by all. Reverting to “previously agreed language”. “Previously agreed language” from ITU and UN-related resolutions, that is. Which is why the Tunis Agenda and Geneva Plan of Action were so very much referred to in the meetings. The participants of the fifth MPP meeting worked through a public holiday in Geneva (Ascension Day on 29 May) as well as a full Saturday session that finally ended during the first hour of the morning of Sunday 1 June. And yet the participants still didn’t reach consensus on all elements of the draft WSIS+10 Vision document. Freedom of expression disagreements, in particular, played out in discussions on WSIS Action Line C9, Media. Proposed text about protecting the safety of journalists—taking into account the International Convention on Civil and Political Rights—was met with a counter-proposal to add text stating that it must be ensured that journalists behaved responsibly as well. The counter-argument to this counter-argument was that while the ethical responsibilities of journalists was something that could be considered, it had absolutely no place in a paragraph about the safety of journalists as it suggested that it was okay for journalists deemed to be “irresponsible” to be killed. Also, not related to the freedom of expression issue, but “bloggers” and “social media producers” turned out to be a highly contentious terms in the C9 Action Line. An attempt at compromise (a large number of delegations had supported the compromises text) wasn’t even allowed to be read at the meeting, as some government representatives strongly objected to new text being suggested very late on a Saturday night, well after the meeting should have ended. “Governance versus governments” played out in the title of Action Line C1. In the 2003 Geneva Plan of Action, C1 had the title of “The role of governments and all stakeholders in the promotion of ICTs for development”. Two years later, the 2005 Tunis Agenda, which was approved by heads of state, changed the title to “The role of public governance authorities and all stakeholders in the promotion of ICTs for development”. Queue major push by some governments at the May MPP to roll back to the earlier WSIS document, which referred to their preferred “government” reference. As pointed out by the MPP Chair, the standard method is to use language from the most recent document (resolution, etc.) and not roll back to previous documents. Other participants pointed out that the lower level folk at the MPP had no right to change the use of language agreed to by heads of state. There was agreement in the end to keep using the Tunis Agenda text, but the issue also played out in references to “stakeholders” (“in their respective roles in responsibilities”, etc.). The gender equality issue I can’t actually talk about yet. I’m still too frustrated that, in the 21st century, some governments can continue to object to language that aims to overcome massive gender inequalities that still exist all over the world. I will blog about that on a separate occasion. Action Line C5, Building confidence and security in the use of ICTs, was where different government perspectives on ICTs and security played out. As with Internet governance, some prefer to promote the opportunities the Internet provides while others are more concerned about the risks it poses (and the need for governments to take the lead in reducing these risks). Similarly, this May MPP meeting reflected differences between those wanting to concentrate on the role of governments and intergovernmental organizations in addressing the risks of ICTs (including cybercrime) and those wanting to include non-government stakeholders in the effort to address both confidence and security issues in ICT. The other elephant in the room, of course, is Internet governance. While Internet governance has specifically been excluded from the WSIS+10 HLE outcome documents, I suspect a lot of people were thinking about how the docments’ concepts about the wider world of the Information Society and ICTs can advance their positions in the more specific world of Internet governance. Text in Action Lines C5 (confidence and security in ICTs) and C9 (media) were the most significant areas of disagreement, with seemingly no way to ever breach the fundamentally ideological areas of disagreement. Include the non-consensus text still in square brackets, with Sections A and B to be endorsed, but just “take note” of Section C.
Include the non-consensus text in square brackets as well as the compromise Action Line C9 text supported by a bunch of delegates in tabular format. Sections A and B to be endorsed, but just “take note” of Section C.
Remove all of Action Line C9 text and all other remaining bracketed text from the Vision document. Have absolutely no section on the Action Lines (on the basis that if there is no text for Action Line C9, it would be inappropriate and skewed to have text on other Action Lines). A variation on this was to move all the Action Line text into a Chair’s report to be presented to the meeting. The Chair’s report could include a summary of the discussion that occurred and include all proposed texts in an Annex. Any delegation wishing to submit a formal statement about any of the issues could also do so, with the statements also appearing in the annex to the Chair’s report. Some governments, however, questioned whether the Chair had the mandate to write a Chair’s report, as it wasn’t specified in the scope of the MPP’s work. Some participants were very reluctant to remove all Action Lines text as they considered that it was better to at least be able to move forward on the agreed Action Lines than ignore all of them equally. Please note that I was watching the meeting remotely, and it was well after 5 am in the morning for me by the time this discussion was at its peak, so there may have been other options that I missed as I struggled to stay awake. It seemed that the Chair was supporting the Chair’s report option, as he invited participants to send any statements they felt needed to be made, that he could include in the annex to the Chair’s report. It seems that only one delegate took the Chair up on his offer: a delegate from civil society, representing APIG, is the only submission attached as an annex to the Chair’s report. In the second part of this two-part post on WSIS+10, I’ll talk about the newly-added sixth MPP that will be held next Monday, 9 June. WSIS started life in ITU Plenipotentiary Resolution 73 (Minneapolis, 1998) later morphed into a UN-wide activity via the 2001 resolution of the UNGA, A/RES/56/183. The view of non-government participants as “disruptive” was not helped by the presence of one civil society delegate who has made a number of rather odd interventions at meetings. In early meetings, the Chair repeatedly referred to the participant as “Civil Society” rather than by the name of the organization the participant represented. This, plus the fact that the participant made repeated references to “civil society thinks/cannot accept” meant that it was very possible that some governments really did think that the participant represented civil society as a whole and that the participant was proof that non-government representatives most definitely are not qualified to participate in negotiations. 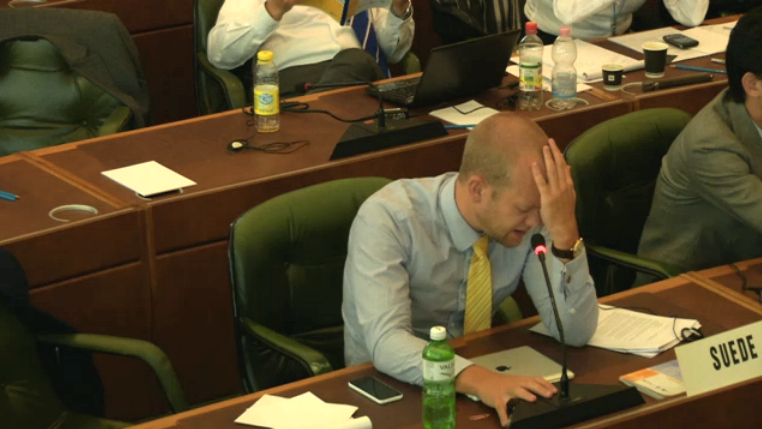 Government delegations aren’t immune from similar odd personalities, by the way. However, some governments seem to be more willing to accept disruptive behaviour from other government delegates than they are from non-government delegates. The printed copy of WSIS Geneva and Tunis outcome documents has a mostly blue colour, so has been frequently referred to as the “blue book”. Australia, however, jokingly referred to it as her “blue bible” in the fifth MPP. After that, most delegates also began referring to it as “the blue bible”. There are 3 Informational documents, but they are numbered 2 through to 4. A week into WCIT-12, INF1 is still a placeholder for a document “be posted in due time”. What can we learn from the large numbers of documents in each category above? When combined with the punishing schedule of Ad Hoc Group, Working Group, Delegation, Committee and Plenary sessions, it’s easy to see why delegates are getting confused about what document is under discussion at any given point in time. Let’s look at that in pie chart form, shall we? 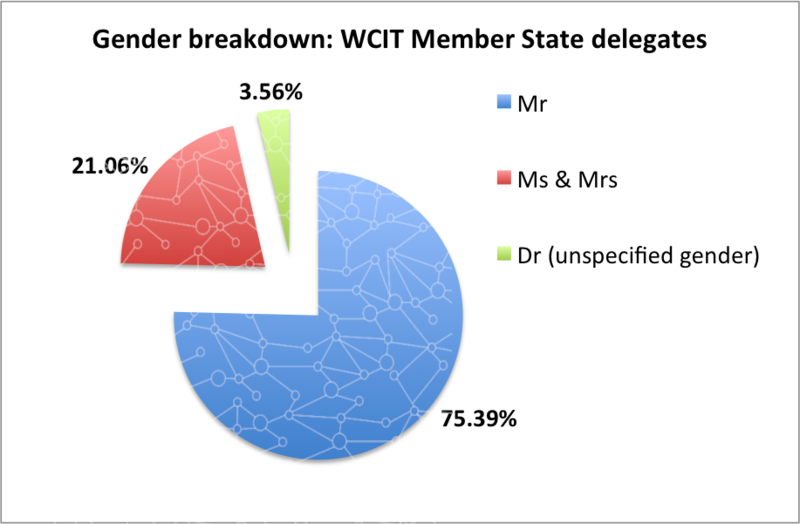 Member State delegates at WCIT-12 are disproportionately male. Given three-quarters of the government delegations are male, I now understand why “Chairman” and “Vice-chairman” are the standard currency at the meeting. I do wonder why 49 of the women felt it necessary to inform the world that they are married given there is no way to differentiate between the married and unmarried men at WCIT-12. I prefer how the Internet Governance Forum registration list works: you’re either a “Mr” or a “Ms”. In an environment where nations all vie to have their ideas adopted as the international norm, getting your proposals discussed before anyone else’s can influence the discussion to your benefit. Equally, the earlier you can knock out your opposition’s ideas, the more chance you have of getting your proposal through. Alternatively, if you are patient, you could sit back, wait for all the other competitors to knock each other out of the running, and come in at the end with your proposal intact. Formal protocol and procedures help prevent a meeting descending into a Lord of the Flies scenario by introducing apparently neutral ways to proceed with discussion. How are we seeing this play out at WCIT-12? There were repeated references to the fact that most of the world’s population still doesn’t have a connection to the Internet. To illustrate the exorbitant costs of connecting to the Internet, the jet-setting ITU Secretary-General, Hamadoun Touré, complained that he had to pay 76 USD for three days’ hotel Internet connection while in New York recently. The Twitter crowd wasn’t sympathetic, by the way, with @stickywcit suggesting Touré pick a hotel with free wifi in future. The opening ceremony may have been full of positive words about ICANN, but the subtle inference in the first plenary was that the Internet community was somehow failing in getting the Internet out to the world’s majority who are located in developing countries. ITU has long positioned itself as the champion of developing country telecommunication needs, so you don’t need to be a mind-reader to see where this may go over the next fortnight. Touré has made it clear that WCIT-12 is not about taking over the Internet, nor about Internet governance. However, what the WCIT-12 is about—connecting the unconnected via broadband, mobile, standards for modems, etc—does stray a little into Internet administrative territory. Newly connected Internet users need IP addresses, for example. And modems need software that can handle IPv6. Last week, Member States at WTSA-12 agreed to continue study into IPv6 in Study Group 2 or 3. At WCIT-12, it may be difficult for ITU Member States to agree on what is relevant territory for ITU to handle under the banner of “connecting the unconnected” without, perhaps, straying into areas already handled by parts of the Internet governance ecosystem, but that are seen as failing the disconnected two-thirds of the world. The first informal discussion group was formed, and met at 8 am on Day 2 of WCIT-12 to discuss whether references to “Recognized Operating Agency” in the ITRs should be changed to the far broader term, “Operating Agency”. Soon, the 8 am informal discussion group slots will be filled and earlier slots will be needed, as well as slots after the official WCIT-12 days end at 5:30 pm. Weekend sessions will be invoked, too. 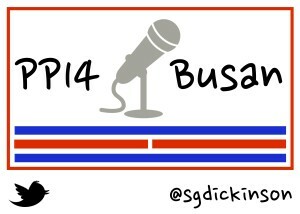 Participants will become exhausted and grumpy. You may not think you should care how little sleep high-level government representatives are getting, but tired officials are less likely to pick up problems in newly proposed text for the ITRs. Tired and cranky officials are also less inclined to feel generous towards their ideological opponents during the more intense debates at the meeting. Touré made a number of comments on the first day of WCIT-12 about his recent travels around the world. I wondered whether these were perhaps a little ill-judged. A lot of developing Member States can’t attend ITU meetings without special funding from ITU. Even then, some of the smallest and least developing states don’t have the human resources to devote to regular ITU participation. Knowing that the ITU Secretary-General is travelling the world and able to pay 76 USD for three days’ Internet access in New York might, to such states, seem as offensive as the large bonuses bank executives received in the wake of government bailouts of banks in the US and UK. On the other hand, developing countries may appreciate knowing that the Secretary-General is travelling to them, rather than expecting them to travel to ITU’s home in Geneva. I am amazed at the lack of gender neutral language being used in the plenary. “Chairman” and “Vice-chairman” were the norm, even when referring to female occupants of those positions. ITU has been very active in promoting the role of women in ICTs (for example, Girls in ICT Day), so the use of phallocentric terminology at WCIT-12 was a bit confusing. Just because most of the positions are filled by men doesn’t mean that gender-neutral terms are unnecessary. 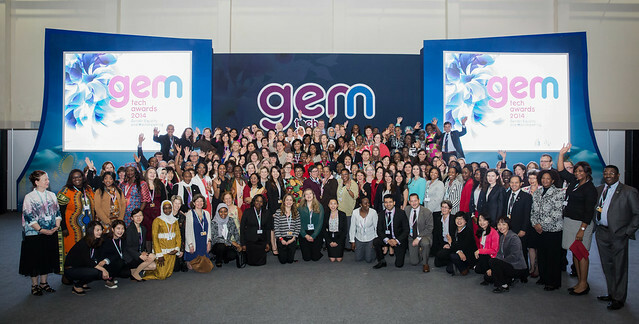 Language helps define norms, and if ITU continues to use “Chairman” and “Vice-chairmen”, even for women in chairing positions, it fails to challenge the outdated norm that men are the natural choice for leadership roles in ICT.